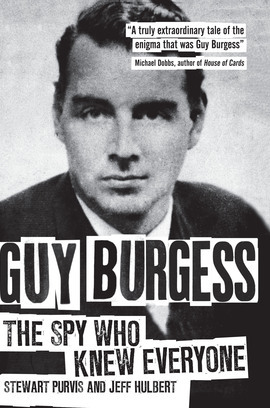 Cambridge spy Guy Burgess was a supreme networker, with a contacts book that included everyone from statesmen to socialites, high-ranking government officials to the famous actors and literary figures of the day. He also set a gold standard for conflicts of interest, working variously, and often simultaneously, for the BBC, MI5, MI6, the War Office, the Ministry of Information and the KGB. Despite this, Burgess was never challenged or arrested by Britain’s spy-catchers in a decade and a half of espionage; dirty, scruffy, sexually promiscuous, a ‘slob’, conspicuously drunk and constantly drawing attention to himself, his superiors were convinced he was far too much of a liability to have been recruited by Moscow. Now, with a major new release of hundreds of files into the National Archives, Stewart Purvis and Jeff Hulbert reveal just how this charming establishment insider was able to fool his many friends and acquaintances for so long, ruthlessly exploiting them to penetrate major British institutions without suspicion, all the while working for the KGB. Purvis and Hulbert also detail his final days in Moscow – so often a postscript in his story – as well as the moment the establishment finally turned on him, outmanoeuvring his attempts to return to England after he began to regret his decision to defect.